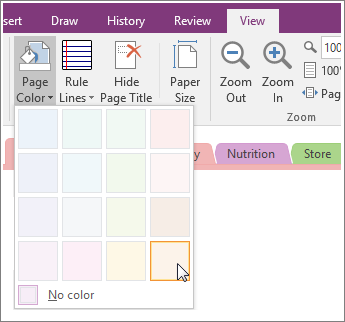 When you create a new page in OneNote it has a plain white background, but you can change that. Color-coding pages with specific background colors is a good way to organize your notebook. For example, you could use one color for notes about a home improvement project and another color for presentation notes. Click View > Page Color. Pick the color you want. Tip: You can also add lines or grids to your page. Click View > Rule Lines and choose a style. If you want fancier designs and layouts, you can apply a template to a page or create or customize a page template so you can use it again and again. Notebook sections are divided by tabs. Changing the color of a page doesn’t change the tab color. 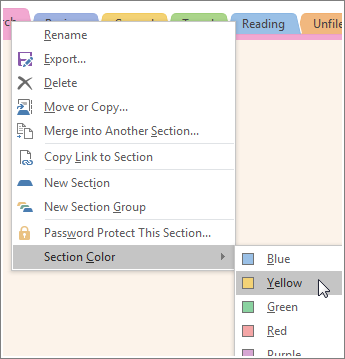 To change the color of an entire section, right-click the tab at the top of the page and choose Section Color. Note: Changing the section color changes the color of the tab at the top of your pages and the page tabs on the right. Your page color doesn’t change though.